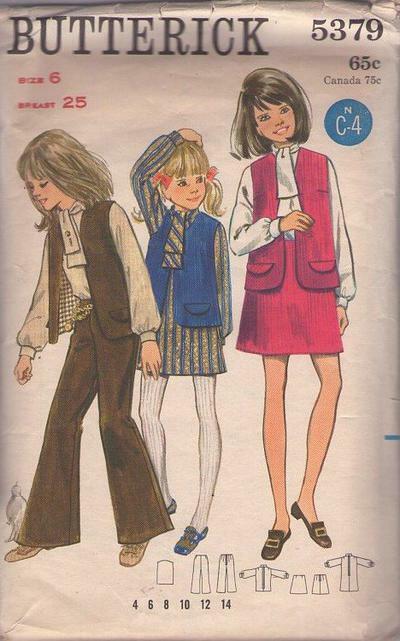 ​Bust 25", Waist 22", Hips 26"
60s 70s Children, Retro School Separates Clothing Patterns - CHILDREN'S GIRLS' DRESS, BLOUSE, VEST, SKIRT AND PANTS A-line dress and blouse have standing collar extending into ties and full length sleeves gathered into band-cuffs. Vest, lined to edge, has bias flap trim. Darted flared pants, and A-line skirt without waistbands. Optional purchased belt.